People's Front says a drop in raw material imports from Russia was a breakthrough by Yatsenyuk's government. An increase in the supplies of nuclear fuel by the US company Westinghouse for Ukrainian nuclear power plants marks a success of the strategy of energy independence from Russia, effectively implemented by the government of Arseniy Yatsenyuk. MP Natalya Katser-Buchkovska, People's Front, a member of the Verkhovna Rada Committee on Fuel and Energy Complex, Nuclear Policy and Nuclear Safety issued this comment on the heels of reports that the South-Ukrainian NPP has significantly reduced the use of Russia-made nuclear fuel for the benefit of the upgraded fuel TBC-WR by Westinghouse. On 19 May, 83 Westinghouse fuel assemblies were uploaded into the core of generating unit No 3 of the South-Ukrainian NPP. "One of the most important steps towards energy independence from Russia that the government of Yatsenyuk has made was a significant expansion of the diversification of imports of nuclear fuel to Ukraine. Over the two years of Yatsenyuk's premiership, Ukraine has significantly reduced the consumption of fuel manufactured by the Russian company TVEL. From the outset, this manufacturer held a 100-per-cent monopoly position on the Ukrainian fuel market, and then for 11 years has successfully blocked any diversification," she said. The course of Arseniy Yatsenyuk towards energy independence, said the parliamentarian, facilitated an increase in the number of energy units that will use Western technology and fuel. "We have denounced an agreement between Ukraine and the Russian Federation on the completion of the third and fourth units at Khmelnytsky NPP. South-Ukrainian NPP will use increasingly fewer assemblies by TVEL and more Western-made fuel. 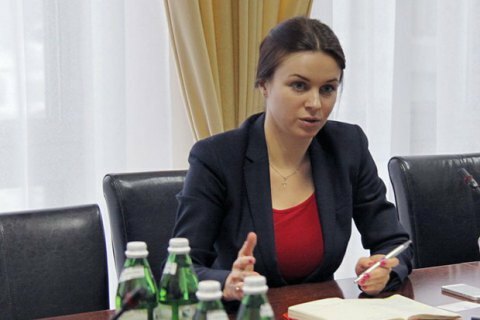 The stance of Yatsenyuk and People's Front efforts in the Verkhovna Rada are helping Ukraine to get rid of just another aspect of energy dependence from Russia," argued Natalia Katser-Buchkovska.